I just realized this morning that today is the last day of the year... Can you believe it? I could not. Honestly, I was sure there were a couple of days left! This year has flown so fast that I feel like I need at least a month to catch up on the wonderful things that happened to me this year. I have a wonderful Family, I am healthy and strong, I saw my daughter on her first day of School, I have met rounds of interesting people thanks to my blog, I have been able to continue making art and doing what I like... I was on the cover of a magazine not only once but twice! And for all, I am deeply grateful. Thanks a lot for being with me trough the year, for your kind emails and your support when I've been down, it means a lot to me. 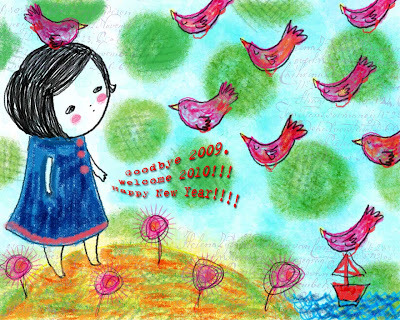 I Hope 2009 was as full of surprises for you as it was for me, and I wish for your 2010 to be even better... I know it will be GREAT! Happy New Year Danita!! Keep making those beautiful girls! I love to see your special creations, they make me smile! I Wish you a Wonderful 2010! I remember finding and watching your paintings on Ebay a few years back and then Etsy and your blog! And then this past year 2009 you were in all those magazines! I plan on starting my Etsy shop this year and if I am able to be even a tiny bit as talented as you, I will be happy! Happy New Year, Danita! Wishing you a happy, healthy and creative 2010! Love your work... any chance of a line of rubber stamps? On the 4th day of Christmas... It snowed again! Let it snow, let it snow, let it snooooow!